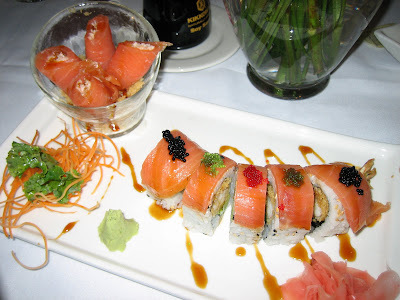 Super Rain Roll - shrimp tempura with avocado and smoked salmon on top - sushi for those who don't eat raw fish! 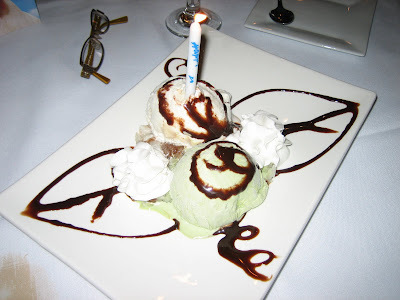 To celebrate several events including a very late birthday for one of the law partners in my office and my two year anniversary with the firm, we visited Rain, located in the Tara theater shopping plaza at the corner of Cheshire Bridge and LaVista. This is a nice place for a celebration lunch as the atmosphere is calm, quiet and soothing and the prices are not too high. We all enjoyed the Super Rain roll and the tempura appetizer. 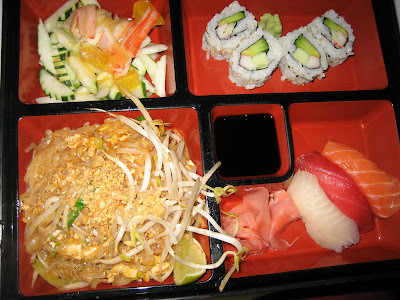 I ordered the sashimi and tempura combination lunch, which also includes choice of soup or salad, several pieces of California roll and cucumber salad. The salmon sashimi (my fave) stood out. 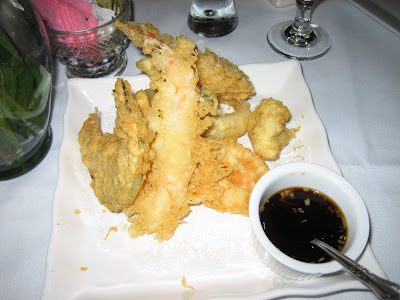 The tempura was excellent also. Everyone seemed to enjoy their dishes, although I did not try anything other than the vegetarian curry, which was appropriately spiced and tasty. For dessert they brought out a complimentary ice cream/sticky rice platter with candle - nice touch! I love sticky rice so this was right up my alley. 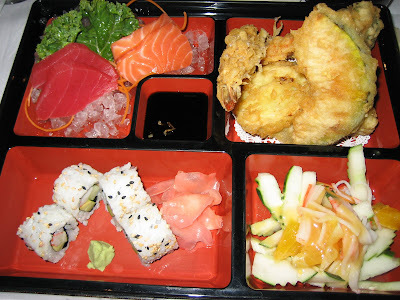 Sashimi/Tempura lunch box - delicious salmon, my favorite! 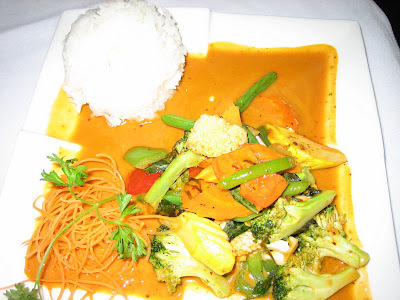 Curried vegetables - nice and spicy. Sticky rice with coconut and green tea ice creams and chocolate sauce. Yum! 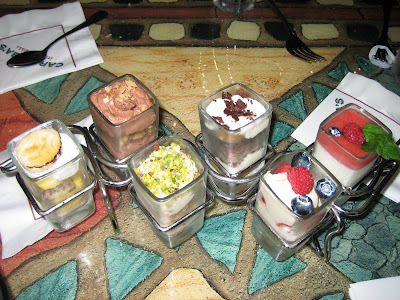 Mini-dessert selection - my favorite: deconstructed cannoli. Carrabba's has always been one of the chain restaurants I can tolerate. It is actually quite good for reasonably priced Italian food. 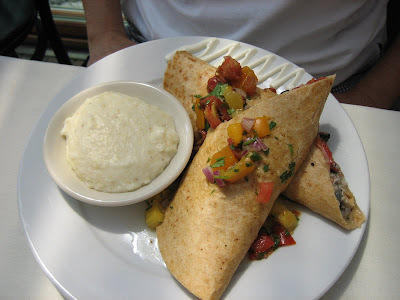 Right now they are running a summer special, with three course meals including personal appetizer and mini-dessert for the price of a regular entree. I love this because the normal entree size is much too large for one person. This way, you are able to experience variety without stuffing yourself. 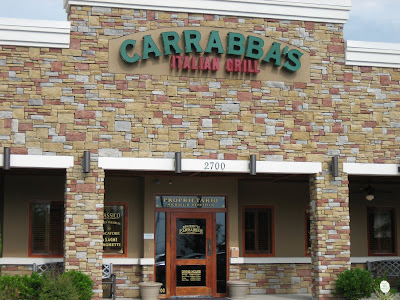 One problem for me with Carrabba's in the Atlanta area is that there is not a location inside the perimeter. 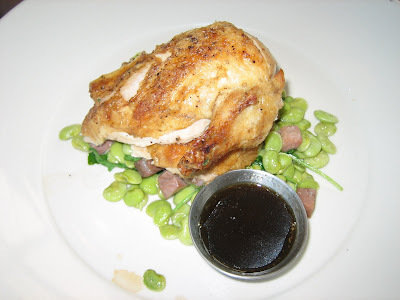 As I rarely venture OTP (as the locals call it) for dining purposes (although there are some great places I want to check out), I was in Douglasville a few weeks ago and thought I'd give it a try. 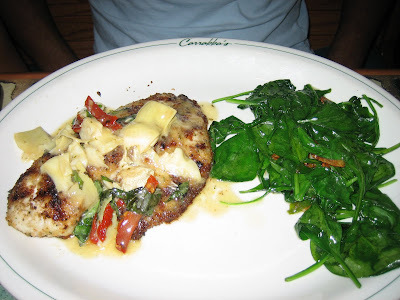 Full disclosure: I was offered a gift card to visit Carrabba's and write this review. Upon arrival on a Sunday afternoon, the place was not crowded at all and we were immediately seated. 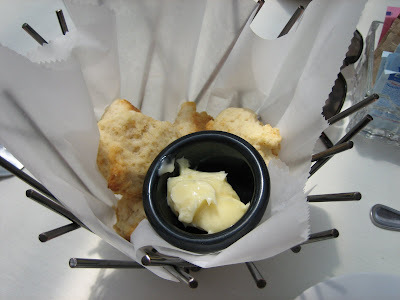 Our waiter, Kevin, was very nice and immediately brought bread and dipping sauce, which consists of an herb mixture with olive oil on top. Cal tried a watermelon splash cocktail, which tasted like a Jolly Rancher to me, but was tasty nevertheless! 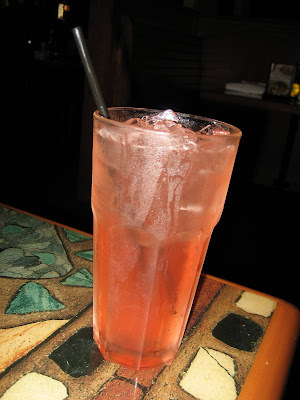 The watermelon splash - very sweet! 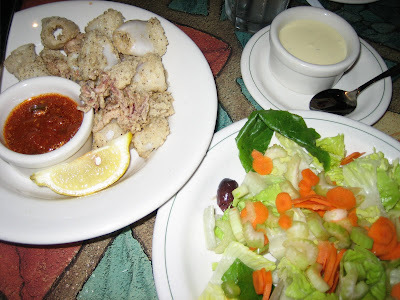 Personal starters: calamari and house salad. The house dressing, a parmesan, is quite good. The calamari turned out great, with light breading and your run of the mill tomato sauce, it was not at all chewy or rubbery. The salad was nothing special, although I do really like the dressing they make. Grilled tilapia with sauteed spinach. For mains I tried the Chicken Bryan and Calvin ordered a special: grilled tilapia with sauteed spinach. 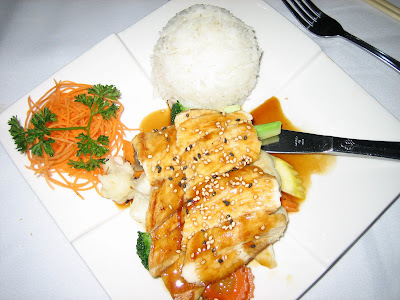 The tilapia was my favorite, but the chicken wasn't bad. The pasta I ordered with my chicken as a side (hey, I had to try the pasta after all!) was okay, although it seemed a little dried out like it was not freshly cooked when the sauce was added. The desserts were a big hit, although the banana one and the cannoli were my favorites - we ended up trying about 5 as we ordered a few extra to sample! 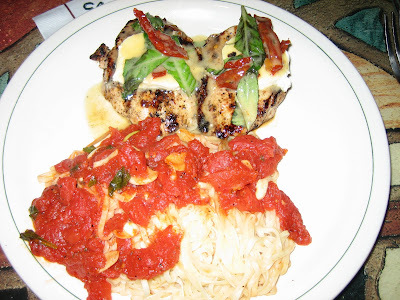 Overall Carrabba's is a good place to visit if you don't know of a local place or if you're dining with someone who likes chain restaurants. 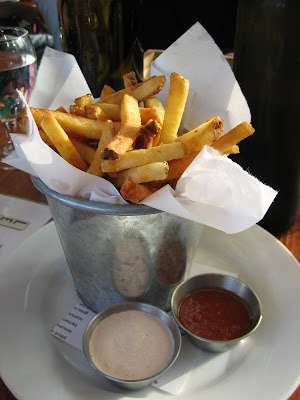 French fries with smoked tomato mayo and spicy mango ketchup. 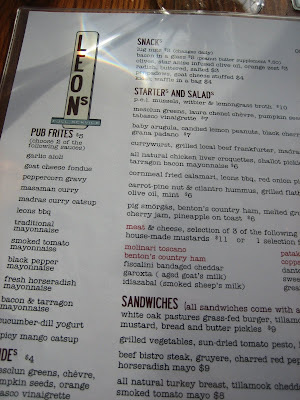 After seeing this placed packed every time I'd driven by on a weekend, I finally tried Leon's Full Service in Decatur. 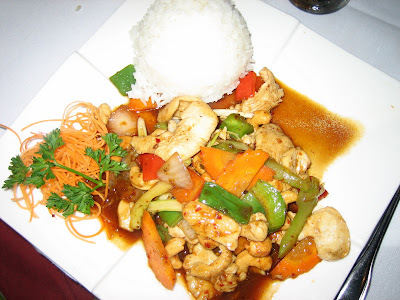 I really enjoyed the experience: our waiter was subtle, yet helpful and attentive, the atmosphere is slightly trendy yet not overbearing or too loud and the food tasted great. My cousin was visiting from out of town and this ended up being a perfect place to take him. Far left - you can see people playing bocce ball. 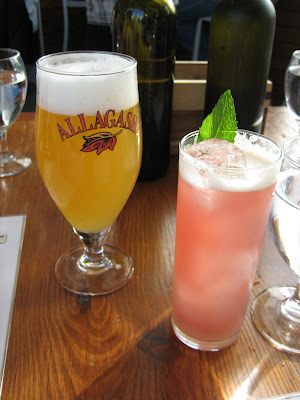 Beer and cocktail - the Halemint: crop organic vodka, mint infused pomegranate syrup, fresh lemon juice, house made ginger beer. I loved this cocktail - and that is saying a lot as I am difficult to please when it comes to alcohol. Menu. They have about 15 sauces available for the succulent fries. Also, sandwiches are available at dinner, allowing for a moderately priced experience if need be. Free range bird - my cousin ate it all so I guess it was good! 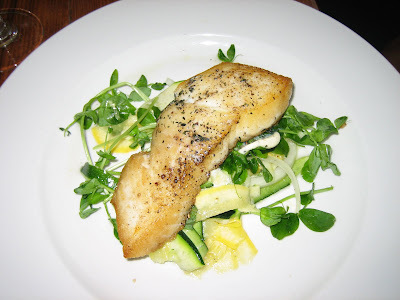 Pan roasted Alaskan halibut - delicious. 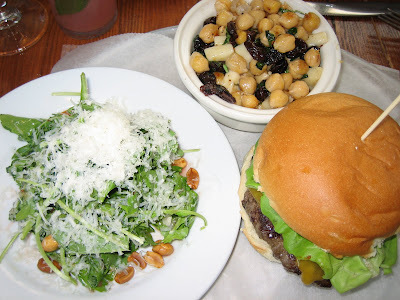 Burger with warm cherry and chickpea salad and arugula salad with candied lemon peanuts. All so good! 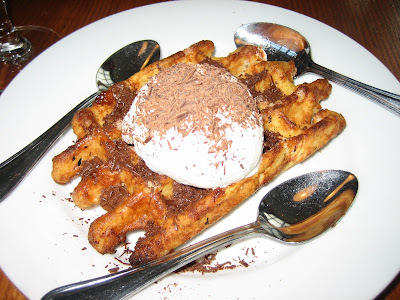 This liege waffle took me back to my trip to Scandinavia - crunchy and sweet on the outside, it really doesn't even need the whipped cream/chocolate shavings. I can't wait to return here! 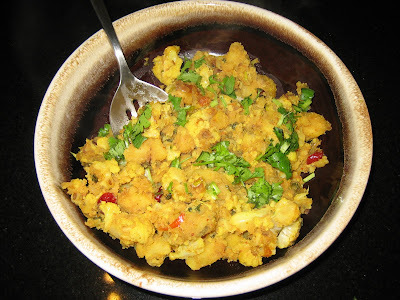 A couple of weeks ago a friend invited me over for homemade Indian food. Everything she prepared was delicious, with just the right amount of spice. 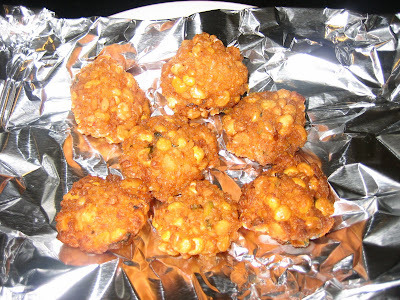 I also tried vadas (below) for the first time. 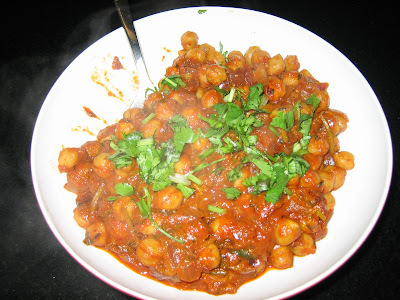 I would like to learn to cook more Indian food as it's one of my favorite cuisines. 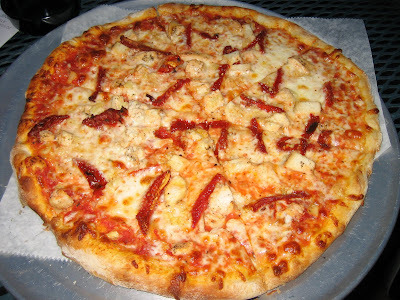 Pie with sun-dried tomtoes, fresh garlic and chicken. 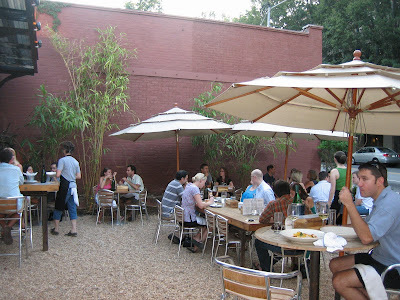 A few weeks ago I met up with a large group for dinner at Urban Pie. I had the arugula salad, which was great, as well as the above pizza. The pizza was very good and I would definitely come back here again. The restaurant was not ready to handle such a large group, however, and they should have engaged additional waitstaff. Still, the waitress did the best she could under the circumstances (apparently they do not have a computer billing system). I don't like when a large group has to divide a check - gets messy and confusing. Thankfully I had cash so I could just walk away! Still, I would give this place another try with a smaller party and you should too! Eggs Carbonara - very tasty. 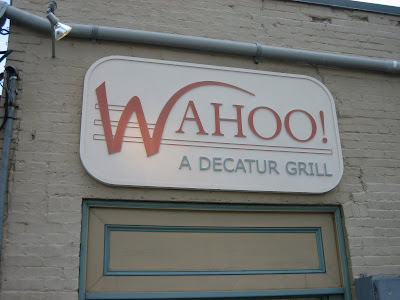 A couple of Sundays ago I went with a group of 5 to Wahoo Grill in Decatur. 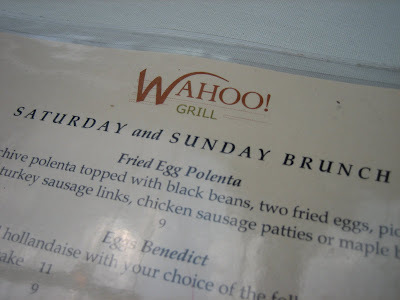 In addition to their brunch menu, they also offer a buffet brunch on Sundays, which looked amazing! We ordered off the menu, however, as we did not want to stuff ourselves before the day even got started. The atmosphere here is the main draw. 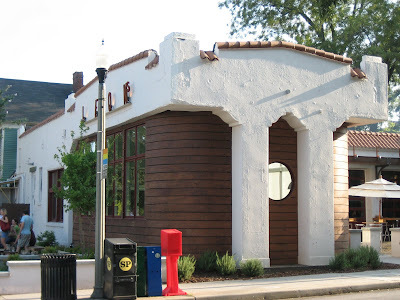 They have an inside section, a glass air conditioned patio and a true patio. 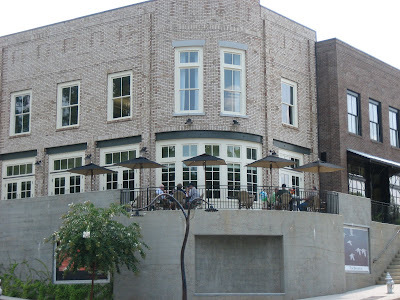 On the outdoor patio, they have live music for Sunday brunch (perhaps other times also) as well as fans and mist-sprayers in the summer, making the outdoor seating quite nice. As for the food, much of what I tasted off others' plates was delicious, especially the eggs carbonara. 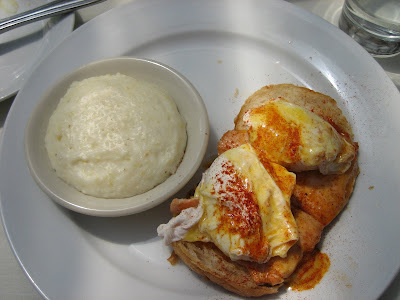 My salmon benedict was terrible, though - the salmon tasted very old and I could not taste any bourbon marinade. It really wrecked what could have been a lovely dish. To the restaurant's credit, the waiter immediately asked if I'd like something else, brought me a complimentary side of fruit and took the salmon off the bill. Still, it was disappointing since I had so been looking forward to trying this place. I might consider it again in the future, but I would definitely stay away from the salmon! Bourbon marinated Salmon Benedict - the only disappointment. Breakfast burrito, also very good. Entrance to the farmer's market. Last weekend my dad visited and we rode out to Serenbe in Palmetto, Georgia on Saturday morning. This community had been on my radar for several months but I had not yet taken the time to check it out. Finding the place is a bit tough, so definitely take directions. There is not a lot of signage on the way, which is a good thing for residents who do not want excess traffic in the area. 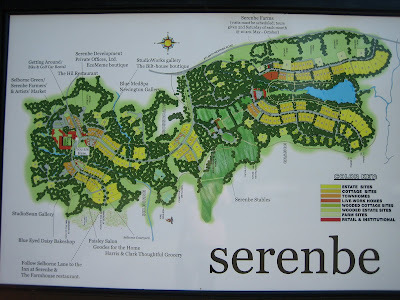 We found out that the founder of this planned community linked the two words "serene" and "being" to form the community name, Serenbe. The idea was to create a community of residences and businesses, without the urban or suburban sprawl that so often comes as a result of development. Thus, the residences are focused in clusters, leaving lots of open spaces and trees. 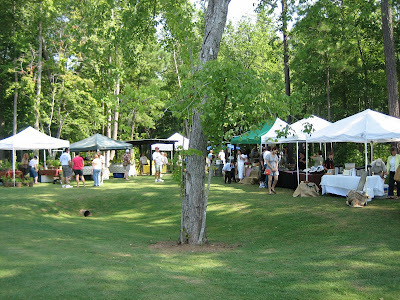 One of the highlights of the visit was the farmer's market, where produce grown right on the property is sold. 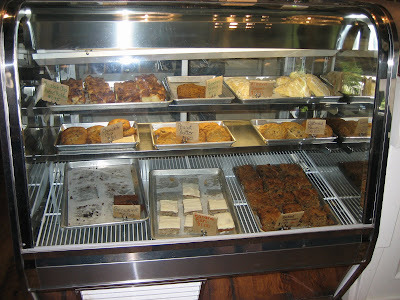 Baked goods, homemade soaps, plants and other gifts were also available. We lucked out and had a chance to sample some barbecue, a special tasting going on just this week. After we perused the market and bought some items for dinner, we walked along several trails and drove around the whole community. 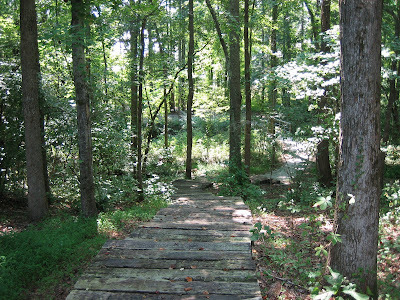 At this time of year the heat made too much walking unpleasant but this place will be great come fall. I was a little perplexed as to how the shops make it here - the restaurants I can see since there is an Inn (see below) but I wonder what sort of business the shops experience. 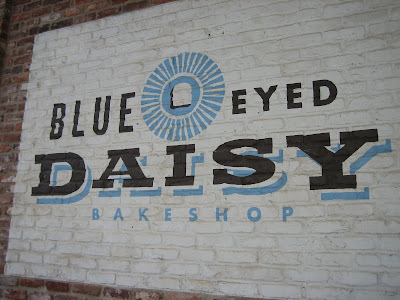 We stopped in the Blue Eyed Daisy bake shop, which also serves breakfast and lunch sandwiches. 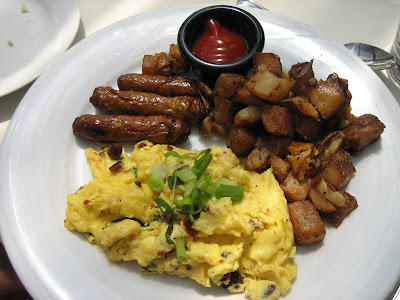 Everything looked delicious but we held out our appetites for brunch at The Hil. 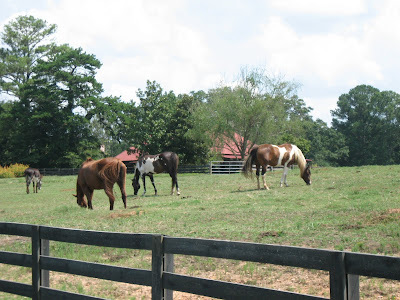 Horses - we saw donkeys and goats, too. 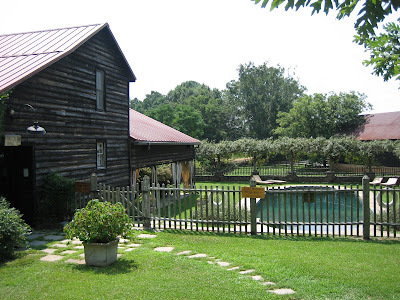 On the property there is a quaint inn, offering various rooms and apartments. Near the Inn is another restaurant called The Farmhouse. This is a definite pick for a one night getaway from Atlanta. 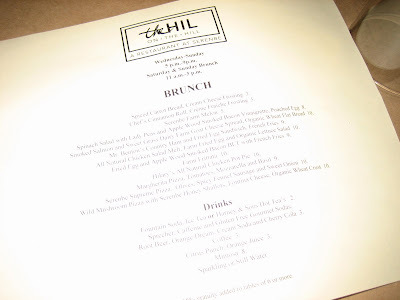 Brunch menu from The Hil. Our brunch was very pleasant as we dined in the airy restaurant. 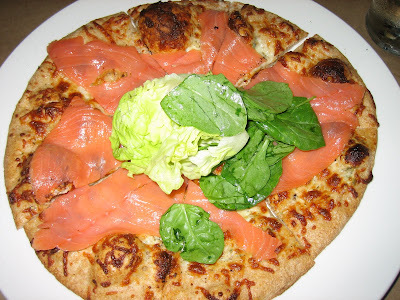 I tried the smoked salmon flatbread with goat cheese and my dad ordered the chicken salad open faced sandwich. What stood out the most were the tomatoes - so fresh and tasty. The Hil highlights produce grown in the community and dinner is also offered Wednesday through Sunday. 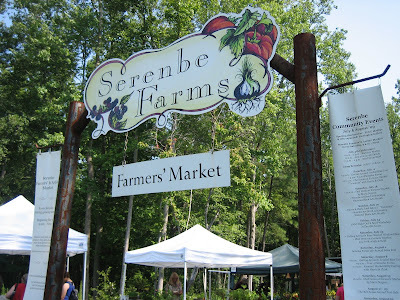 Overall I recommend Serenbe as a Saturday or multi-day excursion for those who like low-key, outdoorsy yet high-class destinations. I will certainly be back! 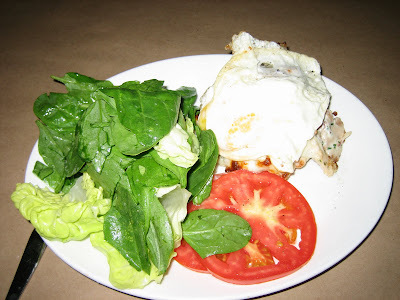 Chicken salad sandwich with egg and green salad - great tomatoes.